Sam watches the great Fusiliers Malta food mutiny – well, almost, until a young officer takes command… and feeds them at his own expense! And in Gallipoli the British Empire and then French forces launched a substantial attack at Gully Ravine, Cape Helles (June 28-July 5), bloody and fruitless, although small gains saw it dubbed an Allied victory (British and Empire casualties 3,800, Ottoman 6,000) – in the midst of it, Ottoman outrage was aroused by the British refusing a courtesy accorded earlier in the campaign: a truce to allow for burial of the dead. 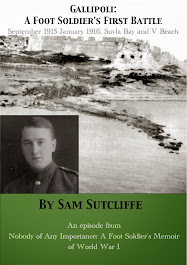 Meanwhile... a few miles north of Valletta, Malta, in a rather barren Foreign Legion-ish stretch of land, the thousand men of the 2/1st City Of London Battalion, Royal Fusiliers, including my father, Private Sam Sutcliffe, his older brother Ted (both underage volunteers, still 16 and 18 respectively in early summer 1915), and their pals from Edmonton, north London, continued their preparation for… whatever might turn up. 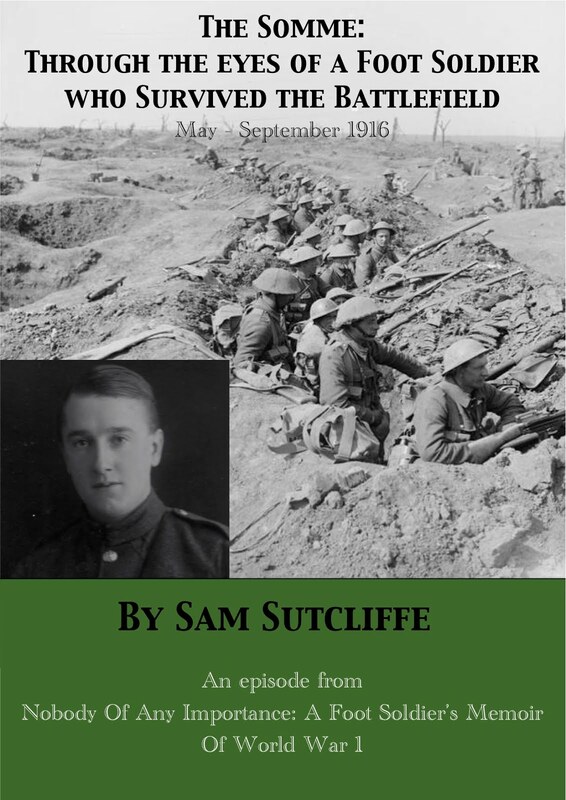 By now, they’d all completed rifle training, while Sam and a handful of comrades proceeded with their study and practice of the Signaller’s multifarious skills. Last week, when St George’s Barracks was commandeered to house a hospital, mainly for men wounded at Gallipoli, the Battalion had to move out of their familiar lodgings to a tented campsite near St Julian’s Bay (San Gilijan) and beside Pembroke Military Cemetery. There, once or twice a day, they observed or, anyway, heard the funerals of men who had not survived their injuries. But music-loving young Sam diverted himself from the morbid speculations this might have provoked by concentrating on the marching band which accompanied each procession and finding a hero in the big bass drummer, whether measuring the solemn tread of The Dead March In Saul on the way in or thumping out Alexander’s Ragtime Band as they departed en route back to their base. ‘At the camp, the food issued to us got progressively worse*. At meal times, the orderly officer and a Sergeant visited the messes and the Sergeant called “Any complaints?” to which, normally, no one responded. It was assumed that a complainant would be marked as a grumbler and might suffer for his temerity. Roused and, understandably, incensed by hunger, more men joined the protest. Little as I knew of military law, I felt certain the ringleaders risked court martial and severe punishment, whereas complaints forcefully but properly made would have brought improvement; the difficulty was finding someone bold enough to stand alone and state the case. As it was, the leader, a chap with wild, staring eyes, pursued his rabble-rouser role with infinite zeal and no apparent idea as to what the next move should be. A young officer made the decision for him. He appeared suddenly in front of them and gave a clear, sharp order, “Halt!” Without quibble, all the marchers obeyed. “Follow me!” he said, and turned and started marching – making himself the head of the column. And follow him they did, on to the road and out of my sight. Later, I heard he had taken them all to a nearby large marquee in which a famous firm of brewers and caterers, official concessionaires, retailed food and drink. That place was the nearest thing to a canteen we had at the time. 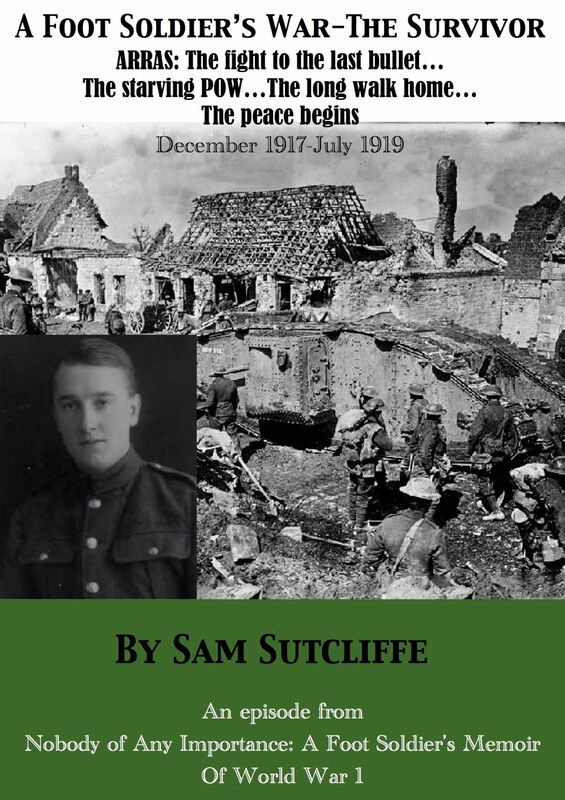 By cheque, the officer – Lieutenant Booth** – bought a large quantity of canned sausages, bread and biscuits and organised their fair distribution to those present. He also undertook to put the mess complaints to the Colonel and told the men to disperse quietly. Thus, a situation, which could have resulted in imprisonment and punishment for decent, but desperate soldiers, was settled quietly by a good man who had some regard for human feelings and failings and not so much regard for the book of rules. Some good did come of the mutiny-that-wasn’t. 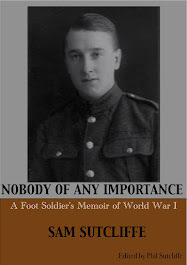 Lieutenant Booth, who had a flair for organisation, accepted a job which would often intrude on his off-duty periods; he was given authority to inspect food stores, to check cooked meals before they were issued to the men and generally to look after the men’s interests regarding quantity and quality of foods. Perfection was not achieved, but sufficient improvement elicited praise from some former complainers. * Regular readers may recall the “hard biscuits… the strongest teeth could make no impression on them… All attempts to eat them had to be abandoned, although an enterprising chap with a hammer and small chisel did chip carefully away at some of them to make what he sold as frames for photographs” (FSS blog 34 8-3-15) and Sam’s wondering “what strange sort of caterer would so bungle his ordering that men’s breakfasts in a hot climate would consist of strong cheese and onions boiled together? This occurred on two or three days of each week for a period…” (FSS Blog 37 22-3-15). ** “Booth” is my father’s alias for Harry Nathan (1889-1963), who – according to H. Montgomery Hyde’s biography (Strong For Service: The Life Of Lord Nathan Of Churt, published by W.H. Allen, 1968) – gained promotion to Captain quite early in the Battalion’s Malta sojourn; one year into a career as a London solicitor when war was declared, pre-war he’d also served as a voluntary organiser of Brady Street Club For Working Lads in Whitechapel; Hyde quotes an August, 1914, letter from Nathan to his mother wherein he’s already noting the importance of giving the troops “green vegetables, but they are not provided by the government”; Hyde also quotes Nathan blaming the poor provision for the troops in Malta (including the wounded shipped in from Gallipoli) on Field Marshall Lord Methuen (1845-1932), the Governor and Commander of all Forces on the island (February, 1915-May, 1919); Nathan wrote that he protested about all this officially and often and sometimes hoped “my remonstrances had a momentary effect”; but biographer Hyde makes no mention of the near-mutiny my father watched – it may be that Nathan (who went on to show leadership and courage on the battlefield) didn’t write home about it, being aware that his letters, like every other soldier’s, would be read by censors. Next week: The Battalion’s on the move again – Sam learns the rigours of marching miles in 80°F under routine PBI load plus Signalling gear. Total: 91 pounds! A hundred years ago… the geographic spread of assorted armies battling reminds us why it was called a world war… the German/Austro-Hungarian Armies finally winning at Gorlice-Tarnów (June 22) to recapture Galicia from the Russians (who suffered 412,000 casualties for their foes’ 87,000); the French repulsing German attacks north of Arras and gaining ground at the heights of Meuse and in Lorraine (21-2); the Italians holding back the Austrian Army at Trentino (22) and in the Carnic Alps (25); the British advancing up the Euphrates in Ottoman Iraq (from 27) and destroying the German port of Buboka, German East Africa, on Lake Nyasa (25) – as, in Gallipoli, attrition proceeded during the build-up to the Battle Of Gully Ravine. Meanwhile... at St George’s Barracks, Malta, the thousand men of the 2/1st City Of London Battalion, Royal Fusiliers, including my father, newly trained Signaller Sam Sutcliffe, his older brother Ted (both underage volunteers, still 16 and 18 respectively in early summer 1915), and their pals from Edmonton, north London, continued their preparation… for what they knew not, though hints were building up that Gallipoli awaited them. ‘Suddenly it was time, they said, for all good soldiers to pack their kitbags, move out of barracks and, a mile or two up the road, pitch their tents on rising ground alongside a military cemetery*. We Signallers had our line of tents alongside the road. One of them we equipped as an office complete with field telephones and we wired up a system connecting the Headquarters of each Company and Battalion and handled all communications. Two things furnished me with permanent memories of that camp. One of them was the frequency with which a band playing The Dead March In Saul** distracted my attention. This would occur once or twice a day because, as I learned, Malta had become the medical base for all the British Services in the Mediterranean area and, inevitably, many men brought to the hospital died of their wounds. Those who died on the battlefield, I gathered, could receive no such military honours – perhaps the Malta garrison authorities were clinging to a kindly peacetime ritual for as long as possible. So you heard the slow beat of the big drum away in the distance, then a few notes of music from the brass would gradually swell in volume as the cortege advanced with stately tread – the blasts from the trombones dominated because they occupied the front row to make room for their slides. If I could persuade someone to take over the headphones, I would hurry from the tent, slither on my backside the few feet down the embankment to the road and await the arrival, the slow approach of my hero, the big, bass drummer: wearing a real leopardskin between his torso and the drum, and given lots of space around him to allow his skilful whirlings of the flying drumsticks with their white, furry tips, “Daa da dada bang! Daa dada dada da bang!” – he supplied the hefty thuds at the end of each phrase. Nearing the cemetery, the band drew to the side of the road. The pallbearers carrying the flag-covered coffin passed through the gates with the firing party. And then I could approach the drummer, show him my admiration of his skill and perhaps persuade him to demonstrate how, amid all the drumsticks’ twirling, he could give the stretched skin a light touch or a hefty wallop just as he wished. The farewell chorus of musketry fire would soon be followed by the reappearance of the troops. Then the really excellent band led the homeward march to a cheery tune so different to the funeral dirge which had marked their arrival. We envied the Battalion which could afford to set up and train that morale-raising band. Apparently, some of their officers – wealthy men – paid for all the instruments before the war. I, at any rate, felt that by providing music for gay or sad occasions, the bandsmen did a good job, even in wartime. If their musical skill made it possible for them to be spared the horrors of frontline warfare, it also enabled them to provide enjoyment to those resting from battlefield tensions. Our officers, generous as their own personal circumstances allowed, had supplied the makings of a drum-and-fife band: a big drum, four side drums, and a dozen or so assorted flutes. Our band volunteers were learning to play them, some doubling with bugles. Soon, we too would have our flagging spirits uplifted and be inspired to march smartly, instead of slouching through the last mile or two of a trying route – it was customary to transport a band to some point where, fresh as paint, they could join the Battalion and render this restorative service to the sorely tried soldiery. We already had a Corporal who played all the calls on a very melodious bugle; he roused us with the Reveille most mornings, and his repertoire covered Cookhouse, Fall In, Sick Parade, Post Corporal, Officers’ Mess, and, at the day’s end, the full Last Post. So, at his musical behest, men ran or halted, put out lights and relaxed into sleep, spirits soothed. * Back in the ’70s, I asked my father if he knew the cemetery’s name and he said the nearest village was St Julian’s Bay (San Gilijan), but he couldn’t remember what they called the cemetery; however, other sources suggest it was Pembroke Military Cemetery, laid out in the mid-19th Century, and that the camp site was known as Pembroke too. The Battalion had to leave St George’s Barracks because the Army decided to convert it into a hospital, largely for Gallipoli casualties. ** The Dead March In Saul is the popular name for the funeral march from Handel’s Oratorio, Saul (1739) – it isn’t the “Funeral March”; that’s Chopin’s Marche Funèbre, Piano Sonata Number 2. *** My father’s thinking of the words to a favourite old song, Alexander’s Ragtime Band, Irving Berlin’s first hit, from 1911. Next week: The food goes from bad to terrible, the Fusiliers mutiny – almost until a young officer takes command… and feeds them!